Former president Bill Clinton says the United States corporate tax rate needs to be cut. In an interview on a radio show in Ireland, Clinton said the U.S. government needs to follow the international trend and reform their corporate tax system to a model similar to Ireland, with a low corporate rate and revenue through consumption taxes. While Clinton said the rate needs to come down, he doesn’t think it needs to be as low as Ireland’s rate. When Clinton came into office in 1993, the U.S. federal corporate tax rate of 35 percent was below the international average of 36 percent, and the rate of 37.6 percent for the OECD (though the U.S. combined federal and state rate was 39.8 percent). Today, the international corporate tax rate is 23 percent with an average rate of 25 percent for the OECD, and the U.S maintains its federal rate of 35 percent (plus another 4 percent for the average state corporate tax). Additionally, the United States now has the highest combined federal and state corporate tax rate in the developed world at 39.1 percent. 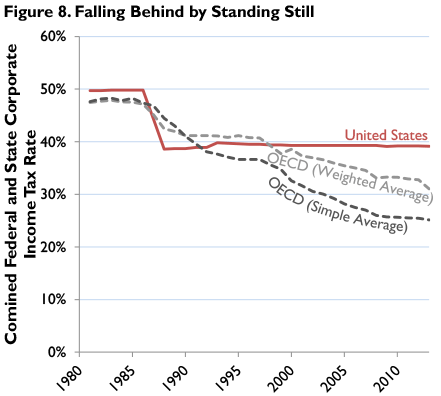 By not reforming the corporate tax code, the U.S. has fallen behind its foreign competition. This is bad for competition. The high rate means businesses have less money to reinvest, making it harder for U.S. companies to compete with foreign competitors. In a globalized world, this has damaging economic consequences, as U.S. businesses face an uphill climb to keep up with foreign competition.